Corneal ulcers are a very common condition in horses. They have large eyes that extend out past their skull, bury their heads in mounds of stalky hay, and spook at the drop of a hat. The cornea is the sensitive clear outer layer of the eye that is only half to one millimeter thick. A corneal ulcer refers to disruption of the epithelium (surface layer) of the cornea. Injuries to the cornea of a horse’s eye are usually the result of some type of trauma. The traumatic incident may be anything from running into a fence post to getting sand, straw, or insect repellents in the eye. Other causes of corneal injuries in horses include eyelid problems, viral diseases, allergies, insect bites, or low tear production. Once the cornea is ulcerated, bacteria or fungus can multiply in the affected area and cause the ulcer to become much worse. If treated properly and promptly, minor ulcers often heal without complication. More serious ulcers may cause permanent scarring of the cornea or even progress until the eye perforates (ruptures). This is extremely painful and if left untreated, causes loss of vision and requires removal of the eye. Some signs of a corneal ulcer include pain and squinting, swelling of the eyelids, redness of the sclera (white part of the eye), tearing and discharge from the eye, and an abnormal appearance to the cornea. This abnormal appearance may include a bluish or white discoloration, blood vessels growing into the cornea, or a dark brown discoloration from pigment on the cornea. We can detect a corneal ulcer by applying a fluorescent-green, non-toxic dye to the surface of the cornea. A careful examination of the eye, using an ophthalmoscope, is generally necessary to identify the underlying cause of the ulcer. Corneal ulcers are treated differently depending on the cause, severity and whether or not infection is present. Minor or superficial ulcers generally heal with topical antibiotics made specifically for the eye, along with a medication (atropine) to dilate the pupil and relieve pain. We frequently put horses on Banamine® for at least a few days even in minor corneal ulcer cases. Treatment may also include debridement of the ulcer, which means removal of the outermost layer of the cornea that is unable to attach to the deeper layers. This is a minor procedure and is done on the farm with topical anesthetics and a cotton swab. More severe ulcers that are in danger of causing perforation of the eye are generally treated surgically by placing a graft over the corneal ulcer while the horse is under anesthesia. Eye injuries should be attended to quickly by a veterinarian to have the best possible outcome! Take a look through your horse’s stall and make sure there is nothing that can poke an eye, such as water bucket hooks, protruding nail heads, or splintered boards. During ‘fly season’, we treat many eye injuries caused by horses rubbing their eyes, or from horses standing next to each other–head to tail–and getting whipped in the eye by the other horse’s tail. Using a properly fitted fly mask can be very helpful in preventing those types of injuries. Remember: “Wait and see” doesn’t apply when your horse has (or you suspect) an eye injury. 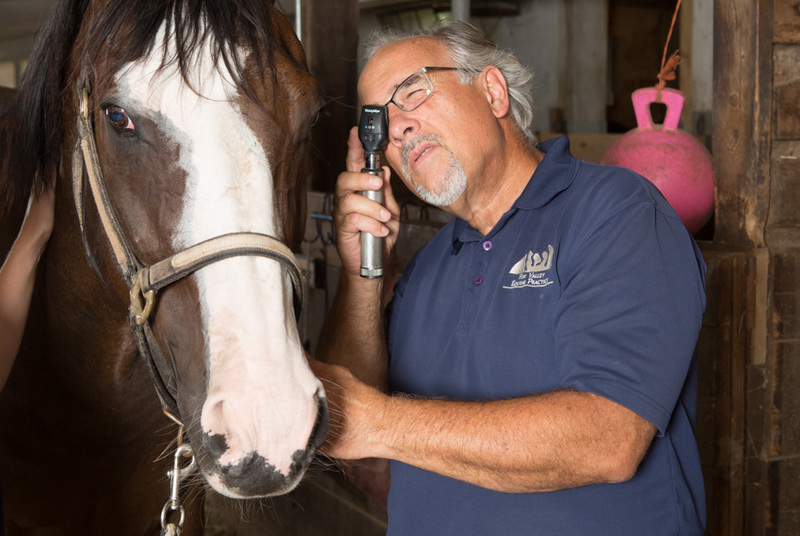 If you’re unsure about whether a vet needs to examine your horse’s eye–call us right away.